Architects provide the vision, the inspiration, the dynamics. It's frequently the charge of the actual producer to make the design durable, functional and a reality. This is where the design team at Global Architectural Panels enters the picture. The job of preparing shop drawings, coordinating with other trades, the method of production, and the installation process all carefully fitted together work to assure satisfaction and pride in a job well done. The process from the beginning at Global follows a typical route. When the architect's drawings of a project arrive, the initial stage is the preparation of shop drawings. This is where all of the engineering begins, and the coordination with other trades is considered. Oftentimes there is a need for more explicit detail over and above what the architect has envisioned. There may be a need for more information. The design department works carefully during this important process. The finishing stages in design call for even more detailing - including isometric drawings to show how the final product is going to look. Following the completion of the shop drawings, the engineers and the project managers will review the system with the general contractor, and the architect. Finishes and systems are approved, and miscellaneous details reviewed with care. Communication with all involved is critical in all projects. 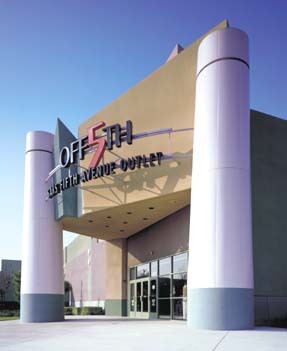 One of the projects handled by Global Architectural Panels was the Saks Fifth Avenue outlet store in Ontario Mills Mall, Ontario, CA. 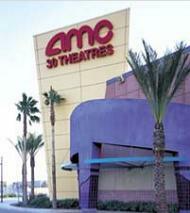 The contract called for the design and fabrication of two custom column covers located at the entrance to the store. The columns were 30 feet tall and 7 feet wide at the base, tapering to 5 feet wide at the top. 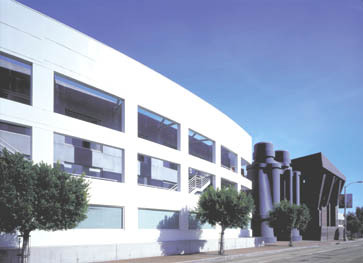 Each column cover consisted of eight sections, three stacks high. This was not a typical column cover. 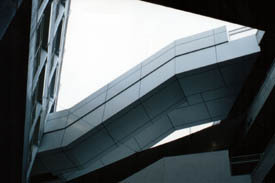 It was important that these individual panels be designed and fabricated so they would align and conform to the radius and the taper of the columns. 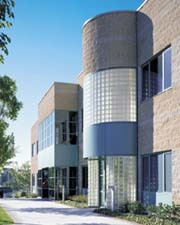 This was an example where the Global designers worked closely with the architect to achieve the desired outcome. 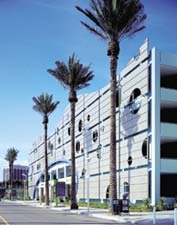 The panels were formed in Global's Gardena, CA plant, and fit together precisely. The design of this system was complex, and Global completed the work in a tight time frame, meeting the construction schedule. Another excellent example of the design and fabrication skills of Global is evident in the recently opened Bloomingdale's department store in Century City, CA.Working from an artist's concept, the design team spent two months creating the vision for this design build project. This was a large job, on an extremely tight schedule, calling for an aluminum wall panel system. 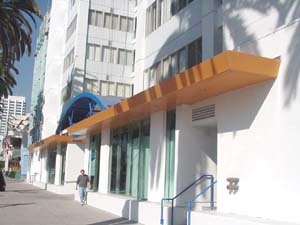 Additionally there were soffits, canopies, fascia and custom painted column covers. 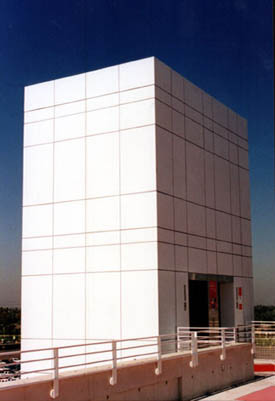 In all there was a total of 70,000-square-feet of 0.125 aluminum exterior skin. We are also into details. Which means that we have the expertise and discipline necessary for maintaining a high level of focus. Your plans may call for rectangular shaped corners, or intricate shapes with curved or multiple bends. We have the skills and the tools such as state-of-the-art auto cad and solid modeling computer programs. There are also high-speed machines for creating roll-formed configurations or virtually any shape.Our products are extruded or fabricated from sheet metal including aluminum, steel, stainless steel, copper, zinc and titanium with coated or anodized finishes. With our Global Architectural Panels Binder at your fingertips, you will have all of the information necessary to make decisions or discuss possibilities. We create and maintain this valuable reference for the various systems, details, specifications, and list of projects. It's all there and a phone call will quickly clarify any questions. Global Architectural Panel estimators, designers, engineers, detailers and project managers know how to work effectively with architects, construction managers, and general contractors. At every level we adhere to strict quality standards in products and services, offering our customers superior assistance in: Preliminary design, Budget estimates, Construction and fabrication details, Selection of materials and finishes achieving competitive pricesIn any case, whether your challenge is to wow them or elicit a genteel 'Yes! ', Global Architectural Panels would welcome the opportunity to become a member of your creative team. © 2009 Metcoe. All rights reserved. 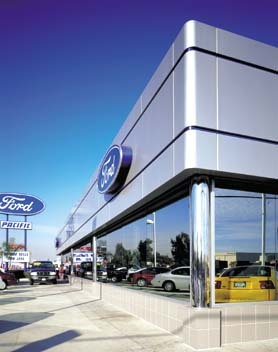 Various size 16-gauge mirror finish, stainless steel column covers and beam wraps were manufactured and installed on this project. 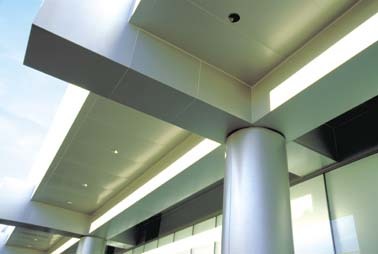 The column covers were designed so there would be no exposed fasteners. Architect: Perkowitz & Ruth Architects Inc.
0.090 prefinished aluminum Fascia and soffit panels, integral with a prefinished standing seam metal roof. 1/8" thick Aluminum Panel System, with a Kynar 500 paint finish. 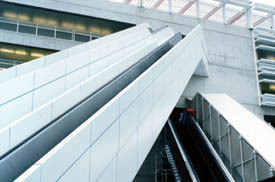 Modular Unitized rain screen system, Model URS-2000, covering over 20,000 square feet of area..
3/16" thick aluminum Panels, Model PBS 187 was used in the five Escalator areas. 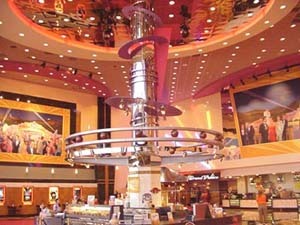 Each of the Escalators were custom built and designed. 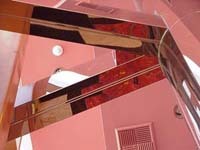 It was a challenging project to custom clad an Escalator five floors up.